i’m happy to be the next stop on the blog tour for Pattern Anthology, a really cool collaboration effort between a group of four talented independent patternmakers. when i was invited to participate, i saw that Shauna of Shwin Designs was one of the designers. i quickly signed up to sew one of her patterns, because i had never tried one before! 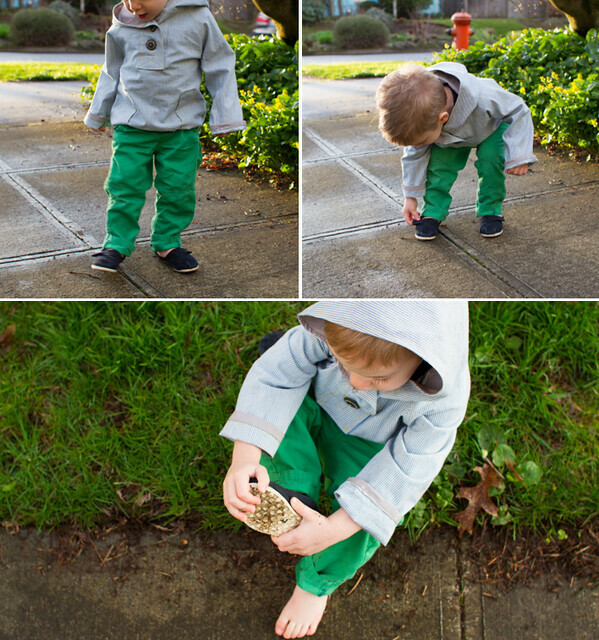 i thought it’d be fun to sew for my little guy, so i chose her submarine pullover (affiliate link) to review today. 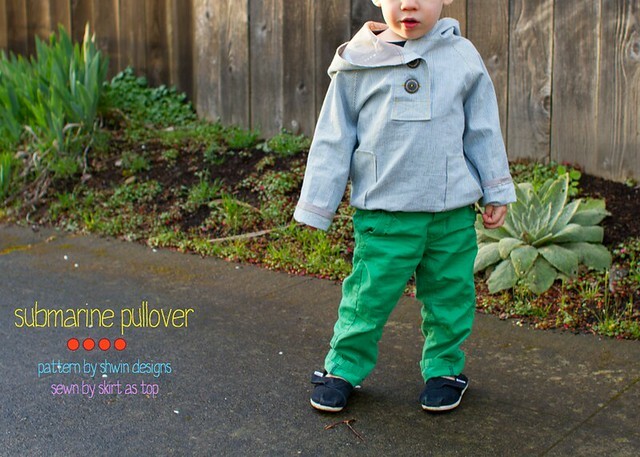 the submarine pullover is a cute little layering hoodie that closes with a button placket. the hood is lined but the rest of the pullover isn’t, so it’s actually a quicker-than-you-might-expect-it-to-be sew. it’s a well-known fact that Shauna is a massive Beatles fan, so i couldn’t resist adding a little YELLOW topstitching to the SUBMARINE, ifyoucatchmydrift! the added topstitching did increase my sewing time, but it still wasn’t too bad overall, especially since i’m not a very experienced placket-sewer and her instructions for that were very easy to follow. my main fabric is a nice drapey seersucker i got at mill end, and the perfect little whale print from jay-cyn’s storyboek line for birch fabrics was sent to me by Jess. i could never part with a fabric as cute as this, but i guess she doesn’t have a boy to sew for (at least for now), so i gladly accepted her generous offering. thanks Jess, it’s so wonderful! this color seems to be out of stock online but there’s a little of the blue version left at fabricworm. the whale print was too cute to use only as a hood lining, so i also used it for the casing at the waist, and bound the sleeves rather than hemming them. it’s also hiding inside the pockets, which i constructed a little differently than the pattern (sewed rightsides together before topstitching them to the hoodie). i had a button conundrum on this one. you need fairly large buttons to be in proportion with the placket, but i didn’t have any in my stash. i hit up my favorite button vendor and found two contenders – these awesome dark blue ones with “grains of sand” inlay, and cool red-orange ones that added a fun pop of color and really stood out. i was stumped, so i put it to my instagram peeps to decide, and it was a tie vote! i went with my gut and chose the blue, and i’m happy i did. classic. beachier. i still added color with the yellow topstitching, which i first did here and love. oh and his ever-present green H&M pants. i’m gonna hate it when he grows out of these, they’re so fun…and somehow go with everything? i sewed the 2T pullover, and it fits O really well. it’s just a tad difficult to pull on since the fabric has no stretch, so size up if you’re in between. once we get it on, it’s totally fine. and his head is huge but the hood fits him really well! his old style TOMS, on the other hand, did not fit well. so he took them off and immediately placed his feet in some mud. boys. the entire beachy pattern collection was on sale through March 24 from Pattern Anthology, but is now available individually at Go To Patterns (affiliate link). check it out! he’s ready for a long walk on the beach. oh and quick side note – i had brought the in-process pullover with me to pick the buttons out, and one of the sales gals said “that is so cute! 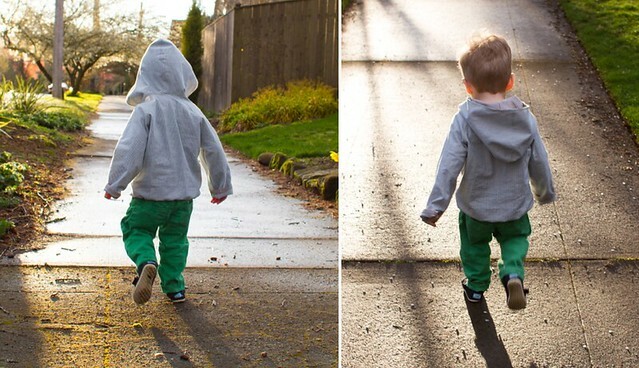 i wish there were patterns like this when my son was little!” i love what pattern makers like Shauna (and many others!) 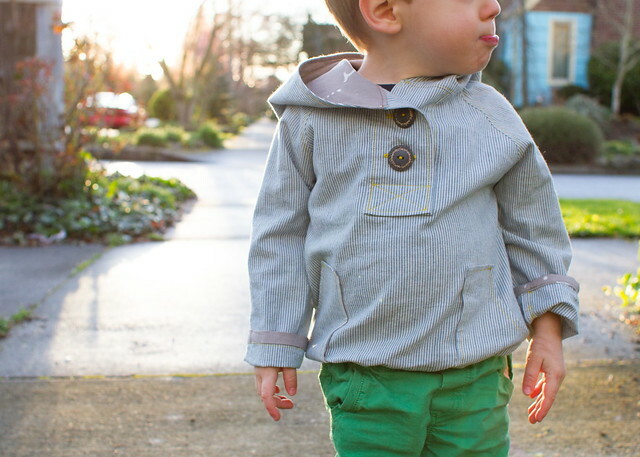 are doing for boy sewing – designing cute, modern clothes that aren’t boring at all. we’re in a golden age! the tour stops have been awesome so far, so if you haven’t seen them popping up around blogland already, be sure to browse the links below…and head over to Go To Patterns (affiliate link) or the individual designers’ shops to nab these great summer patterns! then go ahead and plan a little trip to the coast – these patterns are gonna make you want to. Love it – especially the subtle yellow topstitching. Thanks for being on tour with us! Too cute!! Love the fabric you lined the hood with! What a fantastic version of this pullover. I love the seersucker! One of my all-time favourites for the boys of summer. Spot on, the yellow top stitching with the blue seer sucker is pitch perfect. O is so so cute! 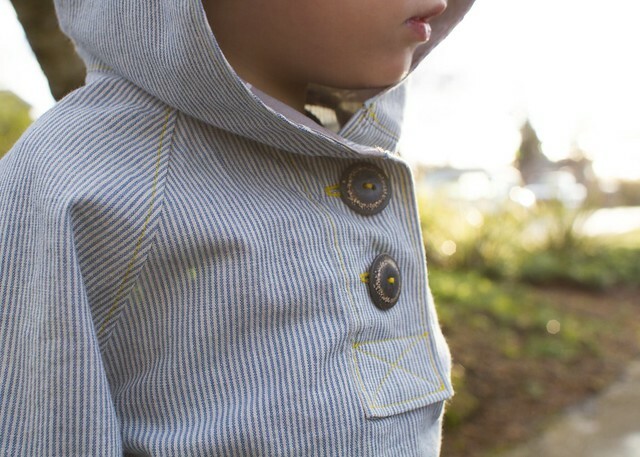 Love the yellow top stitching and good call on the buttons. Great job as always Kristin! 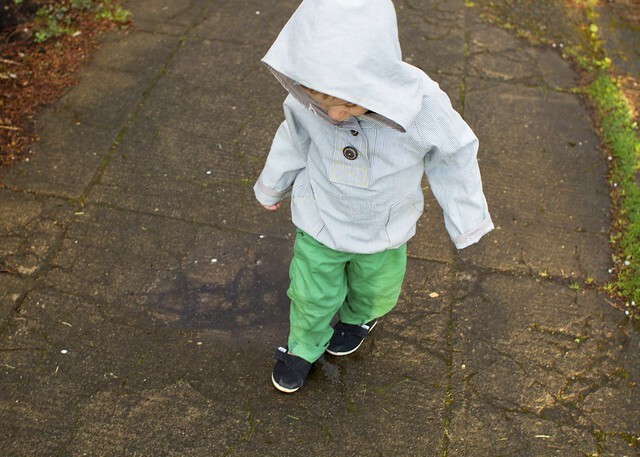 that is such a cute little boy pattern! does it come in baby sizes or just kids? i love the whale fabric – i have some too and that’s such a great use for it. great fabric choices all around and it’s so cute on him! thanks so much!! that whale fabric seemed very *you,* too, i’m not surprised it’s in your stash. the pattern is just sizes 2 – 8 right now, sorry. This is incredible! I love the yellow top stitching, such a subtle pop. I’m going to have to look into this pattern…! love how it turned out-and that O is the cutest! I’m so happy you used that fabric! I am blogging right now about the bandana bib I made using the fabric you sent me….weird….. 😉 Anyways..love the yellow top-stitching too! 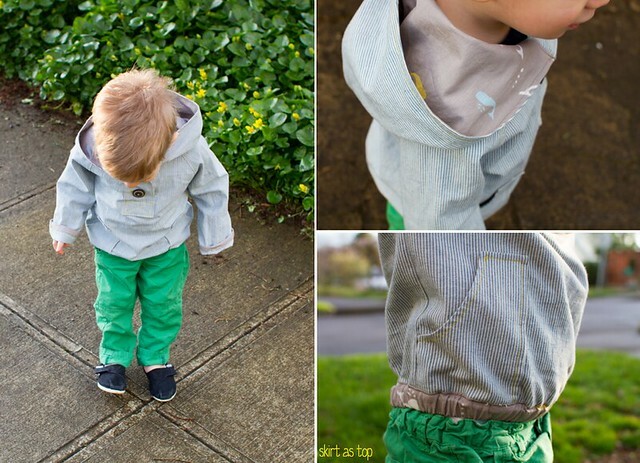 If I had a boy, I would dress him like you do yours! So cute! You can’t go wrong with a bit of yellow top stitching. Great fabric choices too. I’m loving the yellow topstitching! Such a great addition! It turned out adorably! Great fabric combo. H&M has some really great kids clothes too, don’t they? oh gosh, so adorable! that fabric is perfect and the yellow topstitching is lovely!! He’s a cute. 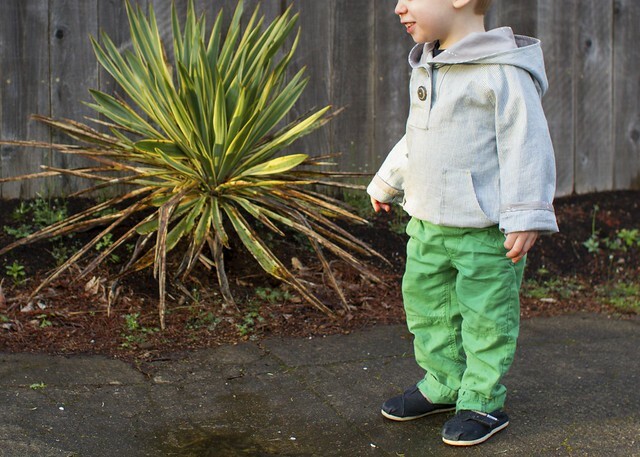 Those green pants are the perfect green. I really wish I had those in my size. I’m certain I wouldn’t be as cute. love the yellow topstitching – such a great detail! 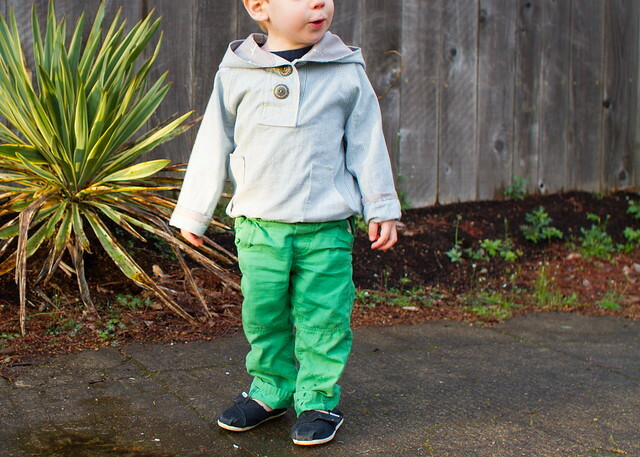 I’m sure you’re son will get a ton of use from this – and many compliments along the way! It’s adorable! Love love love! Striped + big bottons + yellow top stitching = fabulous. Lovely as always Kristin! turned out so cute, love the buttons and yellow detailing. Great job! We love H&M boy pants too. I love your version of the pullover! the fabric you chose is awesome, but I love the yellow thread the most – that is just the perfect added touch! So cute!